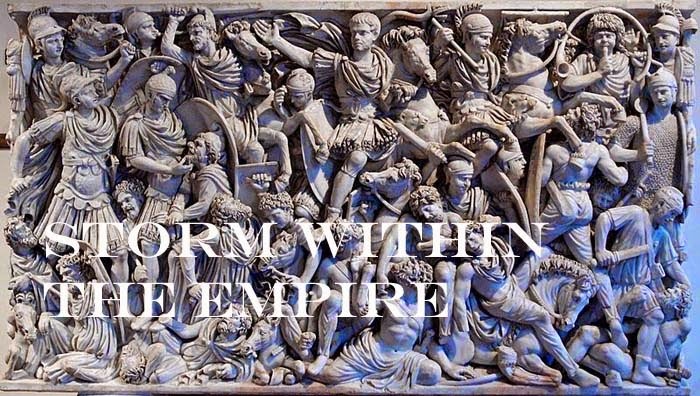 Storm within the Empire: Project Rome – consular legions completed. Project Rome – consular legions completed. As you can see, the colour scheme for the Consular army is very basic, red shields for the Roman troops and white for the Latin ones. Marching toward their enemy these look the business as all the troops have white tunics and black plumes, only the shield colour and shape of the plumes mark any distinction between the two. From on my experience with French and Austrian SYW troops, I gave a thin coat of grey to those areas that would become and applying white as a highlight this gave a subtle impression of depth to what otherwise would seem flat. The ground work for all the troops was done at the same time to bring an even appearance. This time, using less electrostatic grass to cover the ground (less than 30%), I exposed more surface to take the tufts. The German company, Noch, have repackaged their grass tufts offering two colour types which saved a good deal of time when fixing these to the bases. I am pleased with the result and am already thinking about adding a dozen more elements; more Latini infantry and cavalry. Reading Livy’s coverage of the Spanish campaigns I find more Latin troops present among the consular armies. This slight rectification will have to wait until after the Spanish are done. Battle array of the Consular Army. Setting off against the enemy. Marching to their respective destinations, Hispania Citerior and Hispania Ulterior. Thank you both for the kind comments. The Roman cavalry will outnumber their counterpart, but the Spanish to hold the high ground. Reading Livy, the Roman were not exempt from making mistakes and good generals like bad ones were replaced according to the system, every year. This makes campaign design rather interesting.